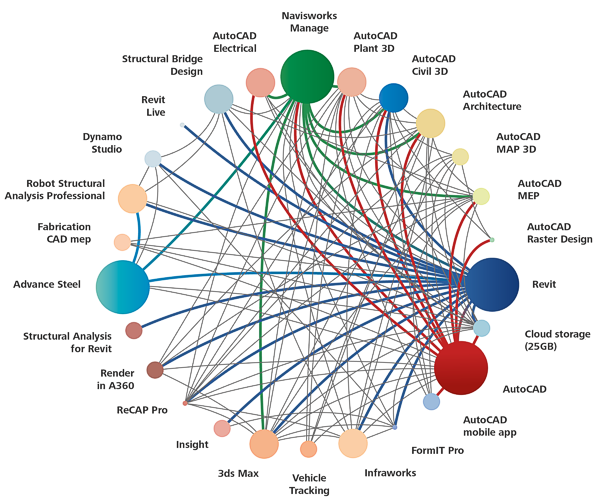 Autodesk AEC Collection includes tools for efficient design of buildings and civil engineering using advanced BIM technology. It offers all the necessary design and presentation tools for 2D and 3D design and architecture - from sketches and conceptual design through calculation, analysis and optimization, to 3D visualization, simulation and presentation. By purchasing a product and get optimal complementary versatile tools covering all the phases (or at least significant part) workflow designer works. And all this from a single supplier, with a single installation, with unified licensing and administration, and of course data compatibility. AEC Collection set while you get for significantly discounted price (for a price only slightly higher than the price of one main product of this collection). AEC Collection kit replaces the original Building Design Suite and Infrastructure Design Suite - for a similar price you get a greater range of products and cloud services. With this collection of tools built around Autodesk Revit and AutoCAD Civil 3D BIM create accurate models and designing better projects in less time. Your virtual designs can be present in a real world environment for visual verification. There have functions for 3D analysis, project coordination and simulation. You have to be competitive. You are constantly under pressure due to cost control and the need to manage more with fewer resources. Are you exhausted from a separate deployment, installation and management of non-integrated software tools. To apply for projects that apply workflows of building information modeling (BIM), but only using CAD. You need to cost-effectively move to BIM. Want to get more out of their existing investments in the BIM process. To effectively work with members of the design team. Do you have difficulty with manual coordination proposals in different formats. You need to gain a competitive advantage in high-end visualization and virtual browsing suggestions. Do you spend too much time communications over the proposals. You need multidisciplinary design software for easier collaboration with partners. To support the feasibility of the proposals and to minimize the cost of rework documentation. Autodesk AEC Collection can help resolve these difficult situations and quickly secure new orders. What contains a collection of Autodesk AEC Collection? Autodesk AEC Collection includes top design and architectural applications to create, visualize and simulate construction projects and piping systems, including Autodesk Revit 2018 E, AutoCAD Civil 3D 2018 CZ and AutoCAD Plant 3D 2018. It covers 2D sketches, 3D conceptual modeling materials, calculations, creation of project documentation including drawings of steel structures, terrain modeling, transverse and longitudinal profile, pipe systems, reports, presentations, and design visualization. Most applications collection is also available in Czech localization.